CONFESSIONS OF A PLATE ADDICT: It's Antiquing Time!...or...Let's Be Baaaaad! It's Antiquing Time!...or...Let's Be Baaaaad! I don't know about you, but my virtual Christmas money is burning a hole in my pocket! My friend Linda and I are going back to the Queen of Hearts in Alpharetta, Georgia, to see what we can buy! Want to come? Remember, it's virtual money! Buy anything and everything you want! Sooo...are any of you sheep lovers tempted? Look at this cute guy...only $39.95! You can't tell from the photo, but he's pretty big! Or how about some transferware? Look at all of the brown pieces! I see a pretty butter dish and a wonderful bone plate. Remember that you can click on the photos and enlarge them to take a closer look. OK, now you know I have to check. Yep. My "goat" rack is still there. Still not on sale, though! Hmmm...$145. Hey...it's virtual money, right? Ohhh...look at this sweet little bunny and cabbage bowl! Any takers? The top of the cabbage lifts off. It's $57. Wouldn't that make a cute centerpiece at Easter? Wow! I've never seen Quimper plates like these! They're antiques at $125 each. Hmmm...or do I prefer the ones with the little Breton man and woman? I'm going to ask my fellow Quimper ware addicts...what do you think? Isn't this a cute couple? The Dutch salt and pepper shakers are $22. I like them because they remind me of some that my grandmother always kept in her window sill. I think they should be switched, so they are eyeing each other. What do you think? Look...Little Red is still here! This is a Hull cookie jar priced at $350. Is that a good deal?? Isn't this the cutest thing? It's a milk glass Santa and sleigh at $28. But wait...the sign says 30% off, so it's $19.60. Isn't it unusual? I love the decoration on the side of the sleigh! Tea for two? Here's a pink transferware tea set at $145.50. I love the matching tray! Oh, this is just so darn cute! Look at those baby chicks! And it's only $39! Shoot! I wish I had brought this one home! I'd have to take some plates off the wall to make room, though. I bet there's somebody out there who wants this one. What a cute idea! A candle in a tea cup! And only $12! If I had this one, I could even do Pink Saturday! This one is pretty amazing! These topiaries are only $8 each! I wish I had another mantel! And that looks like a photo album for your doggie behind them, doesn't it? Can you see the two men hunting with their bird dogs? And this one must be a fox hunt. Isn't this just exquisite? Isn't this beautiful? A Capodimonte porcelain lided bowl for $35. Woah! Marked down from $55! What a deal! Hmmm...Pink Saturday again! I love this little bird clock for only $30! It's not an antique, but it surely is cute! Where can I put it??? Here's a pretty blue/grey dresser for $449. I love the stencil and the glass knobs! What a dainty little Victorian lipstick purse! It's $19, but I'm not sure that it's vintage. Ohhhhh....now I bet we'll have takers for these crowns! I know several bloggers who collect these! I didn't get the price on them, though. Whew! My arms are getting tired from carrying all of this stuff! How did you do? Shall we go get the U-Haul? I don't know about you, but in this economy, I need to do a LOT more virtual shopping! I actually did bring some things home this time, though! I am going to show them to you soon!! ...a few days later, she came home and found it in her dining room with a little note from her sweet hubby Bud saying...Merry Christmas to us! 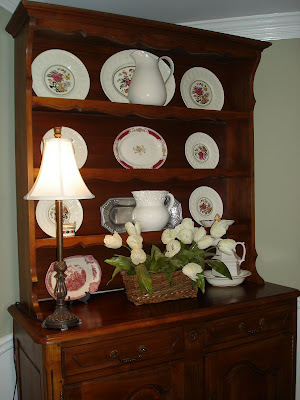 Here it is with her beautiful plates and ironstone pitchers so nicely displayed on it. Isn't that just the best present? And it's not even virtual!! Some gals have all the luck! What beautiful pics! I'm not sure I could have left all of that...especially that sweet capodimonte covered dish. I NEED that! Thank-you for the nice comments on my 1st tablescape and the award. (my 1st) I just took your virtual shopping tour and I love it! In fact I will take the goat rack, salt and pepper shakers,and the rooster/bunny pic. LOL I went on one myself yesterday, however I did buy a few things (so not so virtual) Thanks again, Cindy in cold frigid and miserable Wisconsin. I will take one of everything LOL Everything is beautiful. I enjoyed reading your post. I hope you have a lovely day. Okay the topiaries and all the crowns are already at my house. LOL! Love virtual shopping! That does it....you have inspired me! I must begin a collection of brown transferware. What gorgeous pieces! Oh...you've got me drooling....so thats it tomorrow I'm off to our local antiques centre...well its a small town called Arundel with loads and loads of flea shops and antique shops....hmmm! with prices to match but you've inspired me on. Fun! I want it all! (since it IS virtual shopping! Les photos sont magnifiques - une très belle présentation de notre visite! Et je te remercie très fort de la part de Bud pour tes jolis mots. Je deviens "blogaholic"! You certainly have great taste Debbie! Isn't it fun to shop without actually buying? At least I keep telling myself that! LOL!!!!! Oh, Debbie, what a great shop! A tad pricey! I see my Blue Garland dishes in that shop! lol Oh, I do love the little Dutch boy and girl s & p. Your friend's hubby is a doll to get her that beautiful hutch! That was such a fun trip! The sweet bunny picture & the topiaries really need to come home with me. I call the transferware and the crowns for sure!!!! thanks for the peek...shopping with you is sure easy on my bank book! I love candles so I am being conservative this trip. I get off light, and leave more room in the U Haul for those with furniture, since I can hold my purchase on the return trip. I think I can still hold the Capodimonte bowl also. On second thought, I better leave both behind until I finish my virtual house, to store all these new treasures that I don't have room for in my "real" house. Oh! I want to go antiquing...just might have to put that on my schedule REAL soon! Love that transferware, brown and the pink tea set...the bunny/cabbagge bowl, the bird clock, the....what great stuff! Thanks for stopping by...have a happy week! What a fun shop! I SO want to shop there too! Thanks for the virtual shopping trip. Have a great week! I enjoyed this virtual shopping trip and saw several items I could use. I loved your shopping spree, and I believe I'll take that blue platter, please! Will you wrap that one for me? Thanks! loved the virtual shopping spree... otherwise, I might have run out of money! Seem to be a lot of bunnies around these days... including in my garden! Hi Debbie...I also want the brown transferware & the pink tea set...I think you should make an offer (about 1/2) on that goat rack...'cuz, you never know...they may need to turn something, especially at the end of the month. That was a lovely shopping spree! i bought all of them..virtual .lol...I love all those things...wish I went with you..I love doing that too..I just went shopping yesterday, so go see what I bought on my blog. Oooh! So many treasures! I don't think I'd be able to walk out of there empty handed . . . I have a clock that matches the bunny and cabbage soup tureen. I'll have to snap a pic and put it on my blog! Thank you for the birthday wishes for Kate! She is a dream come true (even her brother thinks so . . . I'm sure it's just the honeymoon stage) and we are so incredibly blessed! Hi Debbie....re your question about the castle in u.K...yes it is lived in still. I think by the Duke of Norfolk (if he's not past)!! !...anyway we always know when they're in as they fly the flag. lol i loved how you got in your numbered word first and then commented ...smart move my dear! Now Debbie...BUY that goat rack oh land sakes...I can't stand it! LOL it is to die for (almost) and I love it....! The mini oil is a steal...and I would delightfully get that as well... I adore placing items in unexpected places....! So funny you show the cabbages...I just got two of them...no bunnies I had to pay 5.00 each and almost fell over! Thanks Debbie, I do enjoy myseld here! Debbie, it's a good thing this only virtual shopping .. girl you know I "love the bunny bowl and the bunny picture. It would go sooo perfectly in my home.. What a sweet hubby your friend has..what a lovely gift. Now, I could also use some of this brown transferware.. Oh gosh.. thank goodness it's virtual shopping.. I really enjoyed the virtual shopping. Everything is absolutely beautiful. I love dishes of any kind. My favorite is the transferware tea set. The Blue/gray dresser is another beauty. God- I am such a transferware lover!!!! It just moves me. haha!!!!! thanks so much for your comment. I agree about that toile kitchen - too beautiful!